Are You and Your Pet Ready for a Disaster? Although the full toll of the devastating earthquake and tsunami that ravaged Japan last week is still unknown, this disaster should be a wake-up call to all of us. As Californians, we need to make sure we are prepared in the event our own disaster strikes. California is constantly at risk of natural disasters such as wildfires, earthquakes, and even landslides. The secret for your pet’s survival during one of these natural disasters is to be as prepared as possible before disaster strikes. This means having a plan and assembling an emergency kit for your pet now, before you need it. By being organized and ready for a disaster, you will greatly increase your and your pet’s chance of survival. Find a secure location ahead of time. Evacuation shelters rarely accept pets, so you need to plan ahead to make sure your family and pets will have a safe place to take refuge before a disaster strikes. If there is a no-pet policy, you can always ask if this can be waived in the event of an emergency. For a listing, go to petswelcome.com. You should also compile a list of boarding facilities (including veterinary offices and animal shelters) that might be able to shelter animals in emergencies. The most important decision you make during a disaster is to take your pet with you. Animals left to fend for themselves can easily be injured, lost, or killed due to exposure, starvation, predators, contaminated food or water, or accidents. In addition to natural disasters, you should be prepared for everyday emergencies. Who will check on your cat or dog, feed them, and give any medications necessary if you find yourself unexpectedly away due to an accident or other family emergency? Find a dependable neighbor and make sure they have access to your house. You’ll want to introduce your neighbor to your pet beforehand to ensure familiarity. Have an emergency kit packed and ready to go with your pet in an easily accessible location at all times. If evacuation is necessary while you’re away, be certain your neighbor is willing to rescue your pet and knows where you keep your pet’s emergency kit. Arrange to meet at a location set ahead of time. * Phone number and directions to a 24-hour emergency veterinary hospital (the 24-hour emergency veterinary hospital in Santa Barbara is Care Hospital at 301 E. Haley Street,  899-2273). Although the main focus of the efforts in Japan are on the human lives, there are a few organizations that are helping in the efforts to rescue animals. As tens of thousands of people evacuate, many animals have fled or are missing and, to make matters worse, many shelters for disaster victims will not accept pets. 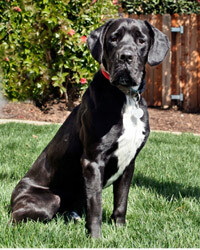 Lincoln is a one-year-old, neutered-male black lab mix (possibly with hound) who weighs 65 pounds. Lincoln is a happy, sociable clown, always ready to play or be petted. He is an enthusiastic retriever of tennis balls. Lincoln is eager to please, quick to learn, ready for training. He is a fine family dog. DAWG (Dog Adoption and Welfare Group) is a no-kill not for profit dog rescue/adoption organization located at 5480 Overpass Road in Goleta. For more information, call 681-0561. You can view more adoptable dogs at www.sbdawg.com. The public is invited to stop by and look around every day from 9 a.m. To 4 p.m.
DAWG relies on volunteers to take care of all the dogs, so if you love dogs, think about volunteering! Students are able to fulfill their volunteer community service requirement by volunteering. Volunteer orientations are generally held every other Saturday at 10 a.m. Please contact DAWG for the next meeting.